I am an accountant who needs a basic calculator nearby at all times. This one is by for my favorite, it is easy to use. The buttons are great and comfortable. The price is amazing. I have about 10 of these floating around in my work desk, home desk, kitchen, craft room, computer bag and purse. Needed a basic calculator for one of my nursing courses, because we weren't allowed to use scientific ones. Feels like it's made better than the really cheap ones. I like it. It's basic, but it gets the job done. I had this exact same calculator years ago and it finally "broke down" so I was very happy that it was still available for purchase. It works really well. Great calculator, I am an accounting student and this is by far the best calculator I have used. The keys are responsive and the screen is easily readable. Would recommend! Great calculator. 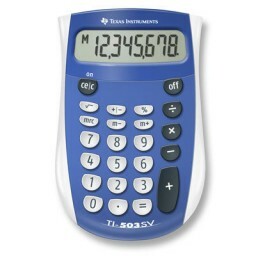 I bought this for a test where we were not allowed to bring in programmable calculators. I failed the test but the calculator was great! Fits perfectly in your hand and does not click when you use it. My go-to calculator in my top drawer, easy to use and no sticky buttons. Just what I needed. Very basic. Good for school. This has lasted for many years. I haven't even replaced the batteries.